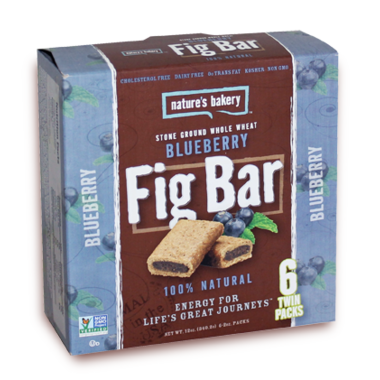 For the power hungry and the just plain hungry, enjoy the berry goodness of this blueberry fig bar. Made with thoughtful ingredients and well balanced nutrition, it satisfies, it fuels and it makes a delicious grab-n-go snack that you can feel good about. Ingredients: Stone Ground Whole Wheat Flour, Dried Cane Syrup, Brown Rice Syrup, Fig Paste, Canola Oil, Blueberry Paste (Organic Dried Cane Syrup, Naturally Milled Sugar, Modified Food Starch, Blueberries, Apple Powder, Glycerin, Natural Flavors, Pectin, Citric Acid, Locust Bean Gum, Red Cabbage Extract for color), Rolled Oats, Oat Fiber, Caramel Color (Ammonia-Free), Sea Salt, Citric Acid, Natural Flavors, Baking Soda, Baking Powder. 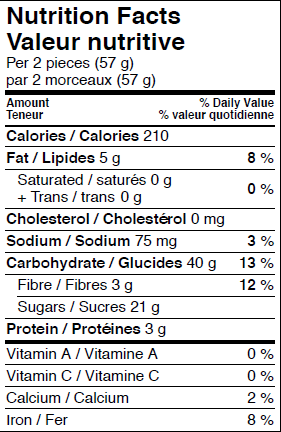 These are my favourite bar snack, they are so good and so healthy, I honestly will pick this snack over chips. I just wish they come in bigger buck. Really good! Soft in texture, big in taste. Would buy again. These were so delicious they didn't last long in our cupboard! I love fig bars and the blueberry ones are so tasty. Love the filling and the fact that they are made from stone ground whole wheat, with no added preservatives. You can "smell" the wild blueberries as soon as you take them out of the package. YUM! Delicious! Much better than those fig newtons I had as a child! This was the first "healthy" thing I tried they are ok.I like that they are in separate pks with 2 in there for a very quick snack but for over $6.00 They are way to pricy. Yummy and a good vegan snack. Why i'm only giving a 4 star as oppose to 5 is that it had this grainy texture. Other than that the fig bar was pretty good. These are so scrumptious! I got my son hooked on fig bars after eating these. The flavour is so nice, they are moist and not overly sweet. Great snack!